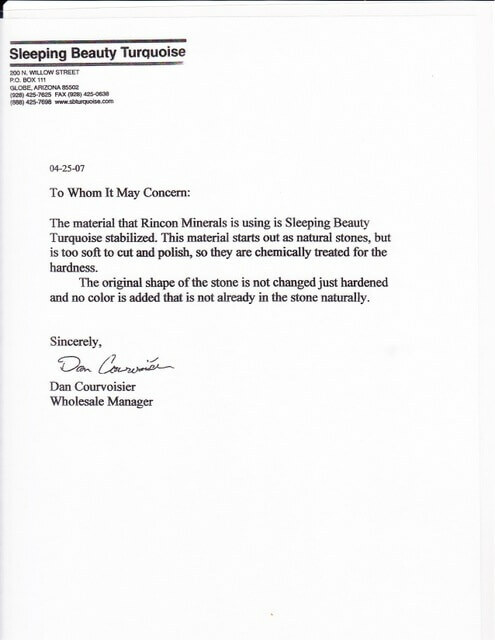 Sleeping Beauty Natural Turquoise has not been altered in any way, it is just as it is found in nature. Our "Natural Turquoise" has a beautiful sky blue color, but over time, when it is exposed to light, body oils, perfume, make-up and/or detergents, its color may turn greenish with age. Due to the natural changes in color of turquoise when it is originally mined, several processes have been developed to stabilize the beautiful color of this stone. Turquoise is put into a stabilizing compound (clear resin or clear epoxy); The stones are then ready to be cut into beads, cabs, etc. No dyes or color enhancements are used. This process does not alter the turquoise properties or appearance. Therefore, we can say that stabilization enhances the Turquoise stone's hardness and durability and helps to keep the original color from changing with wear and age. Our turquoise from Mexico has been stabilized with a clear resin but no color enhancement(dyes) are added. For more information on turquoise click on the links.